Emotional intelligence is important, but the unbridled enthusiasm has obscured a dark side. New evidence shows that when people hone their emotional skills, they become better at manipulating others. When you’re good at controlling your own emotions, you can disguise your true feelings. When you know what others are feeling, you can tug at their heartstrings and motivate them to act against their own best interests. via The Dark Side of Emotional Intelligence – Adam Grant – The Atlantic. I’m an advocate for emotional intelligence. I think emotional intelligence boils down to, don’t trust your emotions, they can betray you. Learning to recognize when you’re having an emotional response is important. When you do, you’ll be able to manage your own emotions and your responses to them. Of course, having this ability also means, if you’re unscrupulous, that you’ll be able to manipulate people who aren’t very emotionally intelligent. Like any tool or skill, it can be used for immoral purposes. The solution, it seems to me, isn’t to think of emotional intelligence as a bad thing. (And to be fair, the linked article doesn’t say that.) It’s to regard it as something every adult should strive to learn, just as they should strive to learn money management and other basics of 21st century life. This entry was posted in Zeitgeist and tagged Adam Grant, Daniel Goleman, Emotion, Emotional intelligence, Health, huffingtonpost, Intelligence, Psychology, Robert Plutchik, Social Sciences. Bookmark the permalink. Thanks Mike, I completely agree that people do take undue advantage by pulling at our heartstrings. we have to be emotionally balanced to recognise that.I have discussed that aspect in another article: Are You Emotionally Balanced. Please go to Archives to read that and link it with these articles, if you like it. Thanks for standing by…much appreciated. I painted that exact pattern on my den ceiling in my drinking days (sans the words and the circles, each leaf was a different color). It would spin when I looked up at it indicating that I made it home and was totally sloshed. I was happy and sad (happy to be home safely and sad about the coming hangover). I am blessed it stopped spinning. 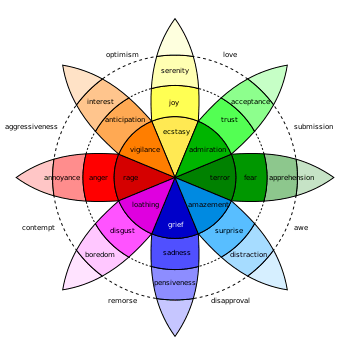 I must study Robert Plutchik’s Wheel of Emotions. Thanks! Spok would be proud of you, this was a major theme of Star Trek TOS. It arose again with Data in TNG but from a different angle. I find that just knowing when I’m feeling an emotion I can shut it off/dow but you have to be able to stop the chain reaction of calculations that lead from current knowledge to the emotional state. If your grandma died and it makes you sad, you have to be able to stop thinking of your grandma or at least of her death. Not an easy game to play. It is, however, not without its rewards. It allows one to remain in control even in the heat of debate/argument and this is most empowering.